In a large bowl of the electric mixer, cream butter until light and fluffy. Add powdered sugar gradually, beating well after each addition. Add milk a little at a time, and vanilla continue beating mixture until it is of spreading consistency. Loosen baked cake from the pan buy running a spatula gently along its sides, using an up and down motion so as not to tear the cake. Still using the spatula, gently lift the sides of the cake, loosengin the bottom part as well so it does not stick to the pan. Place a cake plate over the pan, and invert with a swift sure motion. Lift out the pan so that the cake bottom now becomes the top. Brush off loose crumbs from the top and sides of the cake so these will not mix with the frosting. Cut sheets of bond or waxed paper into 4 rectangles and slip these under the cake. These sheets will catch any frosting spills and keep the cake plate clean. Place the plate of cake on the revolving stand. Spoon about a cup of frosting on the cake. With a spatula spread frosting on the cake. With a spatula spread frosting evenly over the top of the cake. Do not let the spatula touch the cake so that crumbs don’t get mixed with the icing. Mix remaining frosting in the bowl with the rubber scraper once in a while, especially right before spreading it on the cake. Mixing retains the gloss and smoothness of the frosting. After leveling the frosting on top, place about ¼ cup of frosting on the left side of the cake. Rotate the revolving stand slowly clockwise with your left hand, as you hold the spatula upright against the frosting using your right hand. Move the spatula forward and backward in small strokes to level the frosting. Spread more frosting to cover all sides of the cake using the same movement with the spatula. When all the sides of the cake have been covered with frosting, position the spatula steadily against the side of the cake and rotate the cake slowly. This will smoothen the frosting on the sides of the cake. The excess frosting will be pushed up araound the edges of the cake. To smoothen the top of the cake, use the spatula to bring the excess frosting to the top, spreading it towards the center of the cake. Return any excess frosting sticking to the spatula into the bowl. Remove the sheets of paper from under the cake. Hold the cake comb(use the design of your choice) in a slanted position over the cake. Lightly pass the cake comb over frosting on the top and sides of the cake. Use short sweeping strokes to create a wave or scallop effect on top. 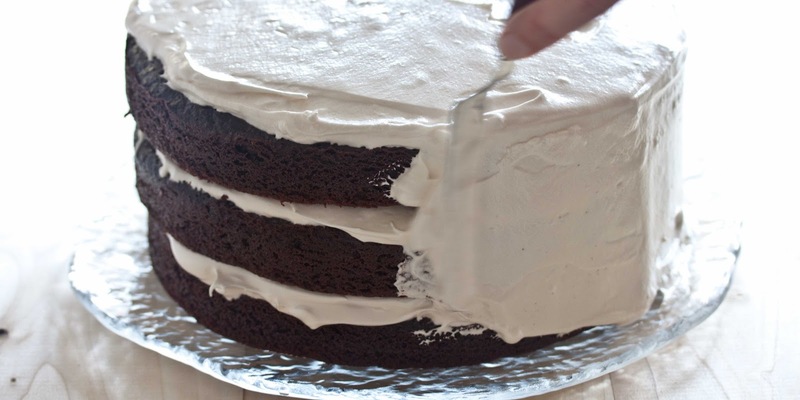 For the sides, move the cake comb up and down as you lightly pass over the frosting to create a zigzag effect. When working on the sides of the cake, start from the left(see note for lefthanders). Cut a sheet of parchement paper measuring 10 x 13. Roll the seet into a cone. Hold the blunt end with your thumb and inder finger and roll towards you. Make sure that teh two pointed ends of the sheet meet. Fold the pointed tip inwaard so that you have a perfect cone. Tape the open side to secure the cone. Cut off about half an inch from the tip of the cone. Insert decorating tips (star tip) into the cone and position it so that the tip is sticking out of the cone. Scoop frosting into the cone, filling it a little more than halfway. Seal the open end of the cone by folding and carefully gathering together the excess paper into a bundle. To make singel shell decorations on the cake, practice on the following movements: press the cone to let frosting ooze out, pause and relax/ release pressure on your fingers, then pull your right hand a slight distance so that the tip leaves a tail of frosting behind. Apply decor on top and sides of cake. Finished product. Ends. When a certain step requires using the righ hand, or when it specifies which side to star, lefthanders may do it the opposite way if this is mor ecomfortable for them. Cake combs, pre cut parchment paper, and ready to use piping bags, are available at baking supply stores or in sto. Cristo, Divisoria. Instead of making your own piping bag out of parchment paper, you may use store bought piping bags. End.